Well my check engine light is on and we have one of those diagnostics that reads codes and it read 113, which says Intake air temp. sensor, but where its suppose to go it has like a rubber cap on it, anybody know whats up? pics? maybe a little more specific? 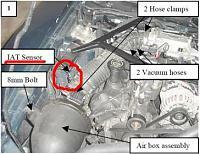 do you mean the location in the inlet tube where the iat should be instead has a rubber plug in it? do you mean the location in the inlet tube where the iat should be instead has a rubber plug in it? Your posts that are really confusing me. What is it you want to know? Where is the IAT sensor? Are you saying that your Air inlet tube is missing a IAT all together and in it's place has a cap covering it? If this is a new problem, keep looking for the IAT because you're looking in the wrong place. Or look for the open hole. ok well im assuming that you obviously didnt put it there, do you have an after market CAI? The only reason i have ever put a plug in there is to relocate it for a supercharger or other FI setup. Im not sure what to tell you if its just gone lol. Can you trace the harness and see if its moved somewhere or taped out of the way? i dont see it running if it wasnt installed in the inlet tube. Anyone else out there with a little more knowledge than myself??? Yes, where is it suppose to go? and what the sensor should look like..
does the rubber plug have a small hole in the middle of it? if so that means the sensor probably worked itself out or was yanked out some how and is probably laying next to the intake tube somewhere. 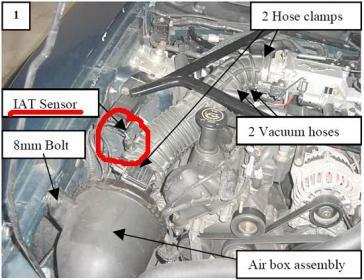 i dont think the car will run without that sensor plugged into the harness so it probably just came out of the intake. Last edited by mustangman36578; 03-29-2009 at 10:57 PM. I'm pretty sure they integrated the IAT with the MAF starting in 02. Look at the wire connector going into the maf. It there are wires in the 2 outside ports of it then the IAT is in the MAF. That code usually means the something is worng with the wiring and its shorting out. +1. Your IAT is integrated into the MAF. Your MAF will have 6 wires going into it, 2 of which are for the IAT. Quick Reply: Intake Air Temp. Sensor?